Read in comfort and style with a pair for every room and a color for every mood. 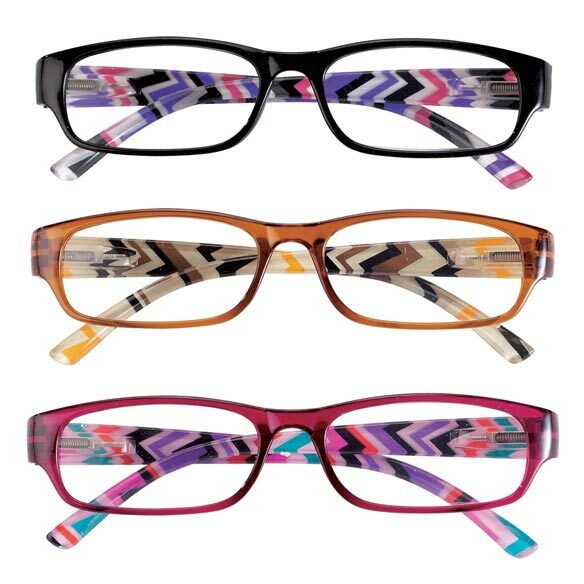 3 pack of women’s reading glasses includes one pair each of brown, black and pink in fun, fashionable patterns. FDA-registered readers are available in 8 magnifications, including hard-to-find +6.0x. Set of 3 includes brown, black and pink. FDA-registered glasses in 8 magnifications. These were a great deal at 3 to a box. The spring temples are amazing. I bought these glasses for my cross stitching projects that is done on linen.Tthe threads are so small and I needed extra strength to see them. This was a good value and now have extra pairs if I should misplace one of the. They came packed well and delivery was very fast. Thank you Miles Kimblall. Love my new glasses. A very reasonable price too. These glasses are great for people who need glasses a little stronger than you can get at the big box stores. The quality is great. They are so pretty and quite functional for reading. I have one in each room for reading instructions, etc. I'm always forgetting to bring my reading specs with me when going to another room. Now I have a pair in the kitchen, living room, and my computer room. They are sturdy and cute with the colored design inside. The glasses are perfect for me. I use these glasses for reading. One pair of the 3, has odd view with the lens, and are not useable. but will use the other 2 pairs. Theyare not just a different magnification for reading, but Not ground to any prescription at all. I ordered and within a month, all three pairs had broken. I've order glasses from Easy Comfort in the past and have always been very please. I need new reading glasses. Why get only one when I can get three. I need more glasses. They have to be distinct as my husband leaves his around. And the price is right. Thank you . I'm sure I marked 6x but I want to make sure . I like the 3-pack. Nice colored frames and shape of the lense. Getting old. My arms aren't long enough to read. price and colors, as well as the strength. for a friend. Higher magnification in retail stores. I chose 6.00, because I need the readers. I can't read the very fine print on medications, recipes and some documents so I needed stronger readers than I can find in stores. Needed 4+ reading glasses which I was unable to find locally. Seemed a good deal! Inexpensive products; great color choices. Great value on hard to find readers in 6.00 strength. I chose these readers because they come in the more serious strength (4.0), which is hard to find in big box stores or even on the web. I needed a stronger pair of reading glasses,found you on Amazon and placed order. Easy. BEST ANSWER: Thank you for your question. This is 1.50x magnification. We hope this information will be of help to you. do you have a age chart to go along with magnifications? BEST ANSWER: Thank you for your question. There is no age limit for this item, they can be used by anyone. We hope this information will be of help to you. My daughter's prescription is -8.0. What strength reading glasses would she use? BEST ANSWER: Thank you for your question. None of these glasses will work out for your daughter, the smallest magnification will be too high. We suggest you consult your eye doctor. We hope this information will be of help to you. BEST ANSWER: Thank you for your question. The sizing is based on the magnification. To figure that out you would need to visit the eye doctor for an exact rating. We hope this information will be of help to you. Are they in soft glass cases? can each lens be a different strength? BEST ANSWER: Thank you for your question. Each lens are the same strength, they can not be different. We hope this information will be of help to you. How do I know which size I need? I just had an exam. I am reading 20/20 but I feel I need more for fine print. BEST ANSWER: Thank you for your question. The lower the rating the less strong they will be. The stronger the rating the more strong they will be. For 20/20 vision I would go with the lowest strength. We hope this information will be of help to you.